I like to stay organized. I admit that I get excited when I see storage boxes with small compartments for organization. Everything has its place and when you need something, you know right where it is. When my closet or desk drawer is perfectly organized, I derive pleasure from just looking at everything sitting exactly where it is supposed to be. It is a beautiful thing. Yeah, I'm a little sick. Maybe even a little OCD, but in general, I rarely lose anything, so my ailment isn't without merit. Pair this with the fact that I love guns and have kids around the house and I have no choice but to pursue a versatile, highly organizable, personal Fort Knox to house my collection. For the last 15 years I have had a sheet metal Stack-On 14 gun safe and it has served its purpose as far as keeping them locked-up and out of the hands of the kiddos. Frankly, other than that, it was horrible for organization, accessory storage, and providing accessibility to the guns. I pretty much had to empty the entire thing any time I wanted to get a gun out of it. I also own exactly 14 guns, so adding to my arsenal was an impossibility with the old safe, it was bursting at the seams. By the way, for any of you fancy lads that think that just because I own 14 guns and want more, that I am some kind of freak, you should read the Bill of Rights. The 2nd amendment states very clearly that we have the right to bear arms so that during a zombie apocalypse we will be able to rise against the undead, shave our heads and bodies, wear loin cloths and spray-painted football pads, and lead the unarmed masses in reclaiming the earth. Your effeminate, emaciated, organic-vegetarian body will not acclimate well to our new cannibalistic lifestyle. You will need a leader, and I will be there to accept your offerings, take your women, and relegate you to a life of labor because of your gluten-free, anti-gun sentiment. As for your woman, bathe her..and bring her to Meatwad. To say there is a wide price range for gun safes would be the understatement of the century, particularly if you are looking for something of size. I couldn't bring myself to spend more for the safe than all of its contents would be worth, so I kept my eye out for something big, cheap, and ostentatious. I think my wife must have had the same criteria when choosing me as a husband. I pretty much decided that $1500 was the minimum required for what I wanted, so I figured there was no safe in my immediate future. That's when I found my holy grail. Costco, master of bulk and variety, had a 51 gun safe, with electronic lock, made by Winchester, on the floor for a cool eight-fitty. It has shelves that can be rearranged, a small feed-through hole for a dehumidifier cord, and although it is technically fire-rated for only 30 min (although it was advertised as 45min), it weighs 700-800 lbs so it is pretty sturdy like the higher rated safes. Good enough for me, sold. Getting it home was a problem as Costco doesn't deliver, so I had to borrow a truck to get it to my house. It took 4 of us to get the monstrosity into the house and over a single step, but after that, setup was a breeze. Stairs wouldn't have happened period, not with these twelve inch "guns" I'm sporting. Also, not bolting this thing to the floor is NOT an option. (how’s that for a double negative?) Like Rosie, it weighs a ton but is pretty tipsy. The door weighs a couple hundred pounds and when swung open, can cause the safe to rock off balance, so you better bolt it down. Sure it takes up half of my office and makes me feel like a teller at Wells Fargo. Maybe it does scream overkill for a house that should probably have wheels underneath and reside in a"park", but in the end, I do have room to expand my guns and a place to store my wife's collection of silver dollars. Even though this is the less expensive option for gun enthusiasts, I like it, and so far, it has served me well. Bring on the Zombies. Good stuff! That's some great writing, made me laugh out loud and may even share on that social networking site, facesmash. Anyway, great gun safe especially for the price therefore at great value. Always protect the second amendment and share with the kiddos as they are the future. Remember anyone can have my guns, but only when they are removed from my cold dead hands! PEELING paint. The safe I purchased paint is falling of the front door. I work in the automotive industry and see the exact same thing on cars when the metal surface is not prepped properly. 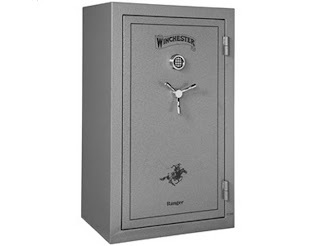 Neither Winchester nor Tractor Supply where I purchased the safe will help me.